Scotland’s gamekeepers will this week commence their biggest ever conservation project aimed at halting the decline of the nation’s vulnerable wading birds. This year is the Scottish Gamekeepers Association’s Year of the Wader and gamekeepers on all grouse moors are getting ready to step up for nature. Curlew, Lapwing and Golden Plover are frequent summer visitors to heather moorland breeding grounds managed by gamekeepers. Scientific studies by Game and Wildlife Conservation Trust (GWCT) showed that waders breed up to three times more successfully on grouse moors, benefiting from legal predator control and habitat management of the staff. However, across Scotland as a whole 56 per cent of Curlew and Lapwing have disappeared in 17 years, with Golden Plover dipping 18 per cent. A 2014 report in Journal of Applied Ecology* states predation is a likely mechanism in the falls, alongside habitat change, and SNH is backing predation research through Scotland’s Moorland Forum. Officials at the SGA are now asking all grouse keepers to note the numbers of the endangered birds as they go about their daily work. They hope that the data will provide answers as to how conservation work to preserve the birds could be targeted effectively across Scotland. “Gamekeepers, through their management, have provided the conditions to conserve waders for countless years, at no cost other than their own efforts and care as they go about their daily work. “However, even on grouse moors, there is a concern at the declines and that is why we are doing this now,” said SGA Chairman Alex Hogg. “What we are asking grouse keepers to do is to help us build a detailed map of breeding waders on their ground and create a baseline for future years. “The birds are coming back now from their wintering grounds so we want people to record the presence of breeding pairs as accurately as they can. The call and trill of the Curlew and ‘peewit’ sound of the Lapwing are familiar on Scottish moors and gamekeepers are keen that this continues into the coming years. They have sought guidance from GWCT on how best to gather the data and will be publishing information to encourage as much engagement as possible. “Gamekeepers might be active in managing in a way that helps produce wildlife but, due to lack of time or working remotely, are not always the best at recording it. “Whilst the principal aim here is to help wading birds, we also hope an off-shoot of this project is that it encourages gamekeepers to get into the habit of noting the wildlife on their ground so we can establish an accurate picture of biodiversity on managed moorland,” added SGA Chairman Alex Hogg. Acclaimed wildlife photographer Peter Cairns believes it is important for wildlife managers to participate in frontline conservation. He said: “It’s exciting to see SGA encouraging its members to get involved in wader conservation. The amount of ground covered by keepers across Scotland makes them ideally placed to monitor breeding success and to that end, keepers represent a valuable, if largely untapped, conservation resource. Minister for the Environment and Climate Change Paul Wheelhouse said: “I welcome the Scottish Gamekeepers Association’s Year of the Wader conservation project, which will see grouse keepers helping to monitoring the population of waders in Scotland. “I hope this and other similar work being done to conserve wading birds can inform us of the conservation work required to halt the decline of these important species which can be affected by predation of eggs, for example by foxes or crows, or arising from impacts on habitats either through climate change or the influences of changes in land use”. Recording Presence and Recording Abundance. 1/ Locate a decent sized Ordnance Survey map of your ground area. Squares should represent 1km square. These pink land ranger maps can be purchased at most walking/tourist information outlets. 2/The waders in this study are Curlew, Lapwing and Golden Plover. When waders arrive on you ground, if you see a breeding PAIR in one of the 1km square boxes, mark either C for Curlew, L for Lapwing or P for Golden Plover in that box. 3/ If there is one pair of Curlew or 8 pairs in that box, only mark ‘C’ once. The key thing is to mark PRESENCE. 4/ Once you have recorded, and the waders are preparing to move on, send the information to info@scottishgamekeepers.co.uk marked “SGA Year of the Wader COUNTS’. Detail also how many gamekeepers work on your ground area and the name and size of your estate. (Estate names will be kept confidential). If you have time, the SGA would gratefully receive data on Abundance. 1/ Take 2 of the 1km square boxes on your map, one where the number of breeding waders is highest and one where they are lowest. This will enable an average to be taken. 2/Divide each square kilometre box into 4 and spend 20/30 minutes in each quarter, recording everything seen. 3/Do this once in both squares, just before the eggs are hatched (likely to be around May) and once again in late June/July so you can see the numbers of fledged chicks. 4/Record all the information and send it to the SGA, as detailed in point 4 (above). Curlew are an Amber-listed species of conservation concern in the UK but their wider decline across their global range means their IUCN status is near threatened. RSPB states: In some upland areas, the control of foxes and crows by gamekeepers managing moorlands for red grouse shooting may be important in maintaining breeding curlew populations and preventing further declines. 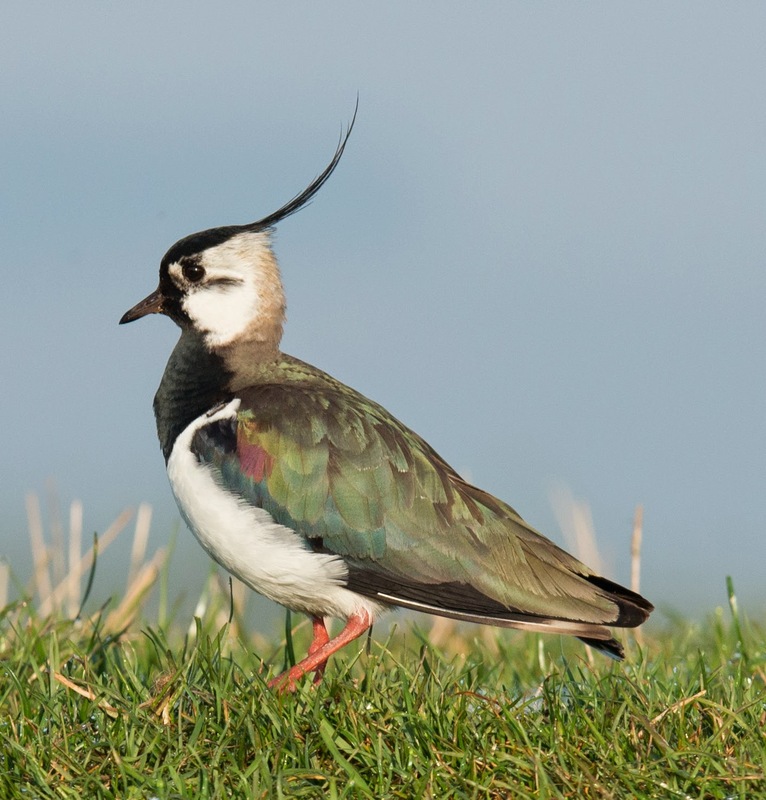 Northern Lapwing are a Red-listed conservation species because of recent breeding population declines in the UK (1981 to 2007).